Lang Realty Company and Hueter Homes developed this residential park in the 1920s. Location: Junipero Serra Boulevard on the west, Monterey Boulevard on the north, San Aleso Avenue on the east, and Ocean Avenue on the south. 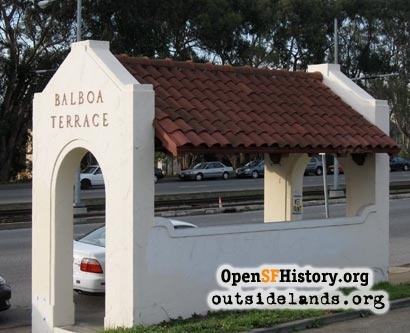 The usual way San Franciscans become aware of the residential park of Balboa Terrace is by seeing its name on the old-fashioned streetcar stop shelter on the east side of Junipero Serra Boulevard between Sloat Boulevard and Ocean Avenue. Drivers who take a quick peek beyond are given the pleasure of a wide pedestrian pathway framed by a semicircle entrance with swooping stone benches and ornamental light standards. The landscaping of the gateway, designed by civil engineers Punnett & Parez in 1920, oozes grandeur and pomp. On the edge of the Mexican land-grant, Rancho San Miguel, the property was under cultivation for decades before homes, streetcars, and wide boulevards invaded the area. From the 1880s to 1920s, Adolph Sutro's forest hemmed in the east side of the land while an open vista to Lake Merced and the Pacific Ocean sloped away on the west. The old Ocean Road, with its scattered bars and roadhouses, ran along the south side, just past the schoolhouse, now named Commodore Sloat Elementary. 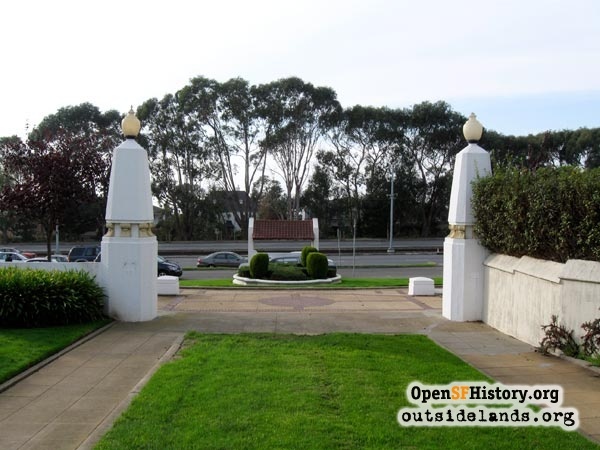 In the early 1910s the Residential Development Company, a large syndicate led by the realty firm of Baldwin & Howell, bought most of Sutro's land north of Ocean Avenue and began platting tracts to become residential parks. The Twin Peaks Tunnel was being planned, and the vision of a new West of Twin Peaks district rode on its coat tails and its promise of a quick commute downtown. The firm of Mason-McDuffie bought a tract for St. Francis Wood and Newell-Murdoch one for Forest Hill. On John M. Punnett's 1914 plat map of the new neighborhoods the rectangular tract of Balboa Terrace was already set aside. Newell-Murdoch ran into money problems at the end of the 1910s. 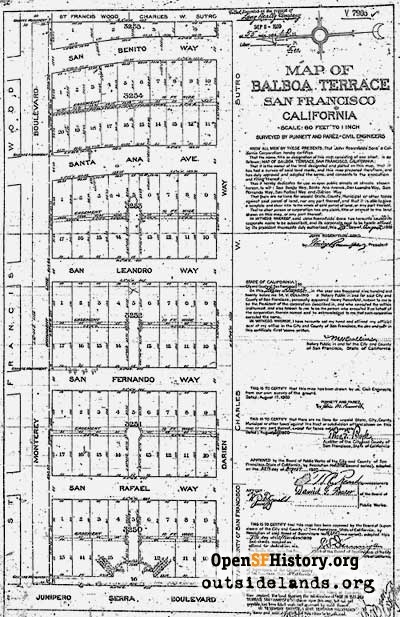 Debts and World War I construction restrictions pushed the company out of the housing development business and the official plat map for Balboa Terrace, designer by Punnett and Parez, was filed in 1920 by John Rosenfelds' Sons Company, represented by the Lang Realty Company. 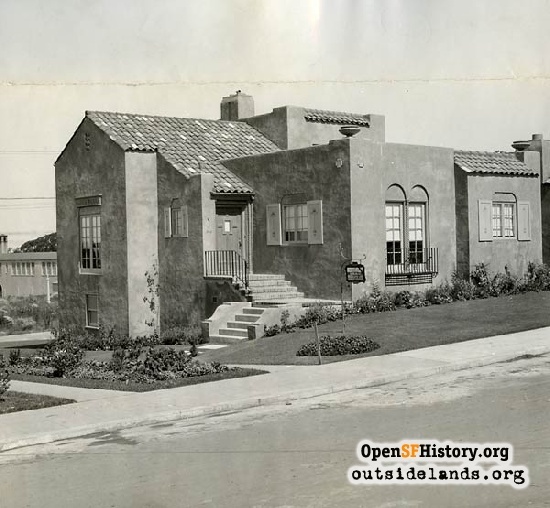 Soon after, Balboa Terrace was purchased by Ernest C. and Oscar M. Hueter, brothers and self-described capitalists. Balboa Terrace was very much a team project. Ernest and Oscar Hueter owned the property. The Lang Realty Company acted as the sole representatives of the tract. Architect Harold Stoner designed the homes, and Walter Zweig supervised the construction. The Langs, Hueters and Zweigs were all related in different ways, so it was also a family operation. As economic conditions improved in the mid 1920s, Balboa Terrace began to fill in with Stoner's storybook homes, all with an element of fairy tale and romance about them. Spanish Colonial Revival was sweeping the city and rustic modular stucco homes went up beside the Tudor and English garden cottages. Easements in the center of the blocks put the garages at the back of the homes, giving the streetscapes a more unified and clean appearance. The Hueter brothers toured model examples of residential parks in various cities6 and the Balboa Terrace restrictions were common for such communities at the time: minimum construction prices and building setbacks, lots reserved for residential use only, and ownership and occupancy limited to a certain ethnicity. 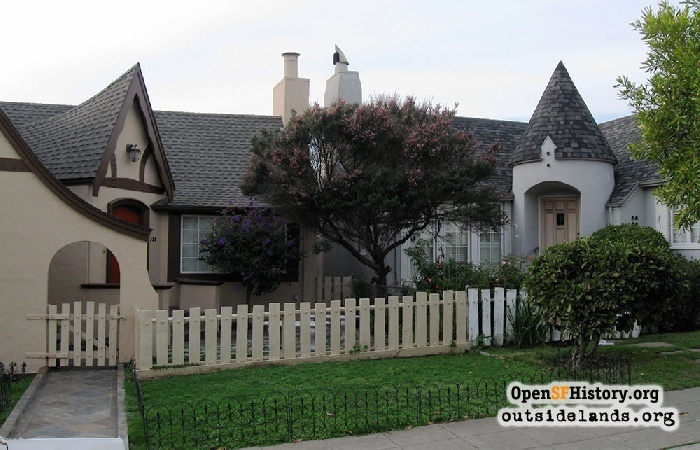 The deed restrictions, conditions, and covenants issued by the Balboa Terrace Homes Association in 1924 directed that "...[property owners] shall not convey, lease or rent the said premises, or any part thereof, to any person or persons other than those of the Caucasian or White race." The legality of such racial covenants was struck down in the late 1940s. 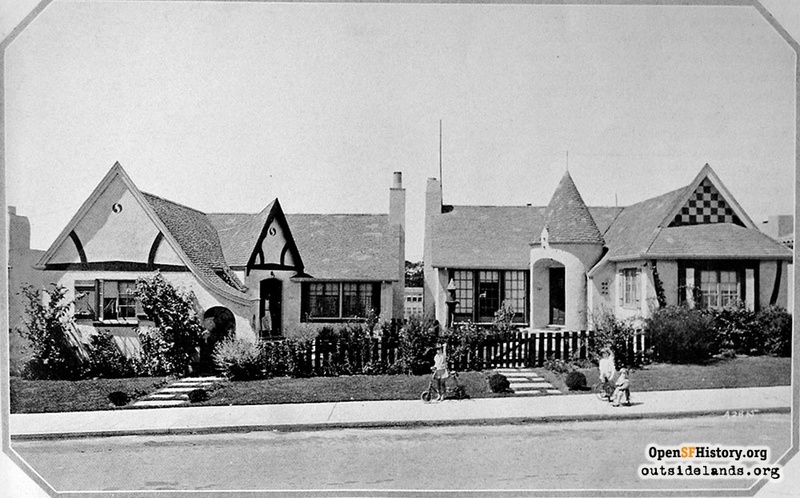 Larger homes also took root in Balboa Terrace in the booming 1920s. The smaller bungalows were joined by two-story houses. R.D. Lang's Balboa Terrace residence, self-described as a "pretentious home," was designed with "Italian villa" features.7 Architect Harold G. Stoner gave the buying public---who were purchasing Balboa Terrace houses for as high as $20,000---what they wanted: Spanish Colonial and Italian Renaissance Revival buildings with lots of stucco and decorative tile. Advice to all who aren't driving by Balboa Terrace: there's no public transit stop at the old streetcar shelter. 1. "Harmony in Design Marks Building in Balboa Tract," San Francisco Chronicle, September 11, 1926. 2. "Operators Buy Improved Park at Ingleside," San Francisco Chronicle, May 4, 1918, page 11. 3. "New Building Held Factor to Drop Rents," San Francisco Chronicle, October 30, 1920, page 18. 4. "Homes Built in Balboa Terrace," San Francisco Chronicle, May 21, 1921, page 7. 5. "New Tract West of Twin Peaks Thrown Open for Residential Park," San Francisco Chronicle, August 2, 1924, page 6. "Lang Firm to Subdivide in Sutro Forest," San Francisco Examiner, August 2, 1924, page 9. 6. "Residential Parks Popular," San Francisco Chronicle, April 11, 1925, page 8. 7. "Where West of Twin Peaks Begins," San Francisco Chronicle, April 18, 1925, page 10. 8. L.K. Barton, "A Place to Live," The Home Designer and Garden Beautiful, October 1926, page 170. Page launched 10 December 2008.